Metallics can be a great way to add flare and make a room truly sparkle, however it can be difficult to know when and where to place them in your home. How can you add in metallics without going overboard? See below for tips and tricks on how to make your space shine without being overdone. Adding in metallics in smaller doses or in pieces that aren’t used every day is a great way to add sparkle to a room. Adding in metallics through artwork, candle sticks, hardware, accessories etc are great ways to add little touches throughout a space. Using more “non chalant” items like these to work cohesively also allow for flow through the space and keep the viewers eye carrying through a room. Harmony is created through the use of repetition in the space. 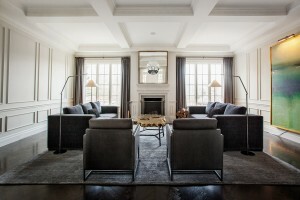 By using one accent piece, this draws the viewers eye into the room. 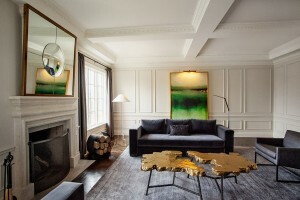 In this particular room, the coffee table acts as a showpiece whereas smaller pieces work in symmetry to compliment it. (eg floor lamps, mirror frame, artwork frame etc) Choosing one piece and stemming other items to work in unison with it keeps a balanced look in a space. 3.Another way to add metallics to a space is through lighting. Lighting is so important in a home and having a well lit room is highly sought after. What better way to brighten up a space than a piece that not only gives off light, but also reflects it? Using metallic lighting fixtures can bring an extra bit of glam to a space and really brighten it up. Your lighting fixture can also act as an accent piece or even an inspiration for the décor to follow throughout the rest of the room or home. Adding touches of metallics in lighting can be brought into any space no matter the style and can take your space to the next level. that can be used. This is not true! Metals can completely be mixed and look fabulous in a space. metals can make a space warm or cool and mixing them can give you the best of both worlds!